Lucy and I went down to San Luis Obispo (a 3.5 hour drive) to visit Nik for the weekend and take in some of Cal Poly's "Parent's Day" and Open House festivities. Beautiful, sunny day, low 80's... you couldn't have asked for better weather! Aimed primarily at next year's incoming students and their parents, there were the expected rash of speeches and receptions, but I was just impressed with the overall spirit and festival atmosphere on campus. Student clubs set up scores of booths publicizing the wide variety of activities available to incoming students. 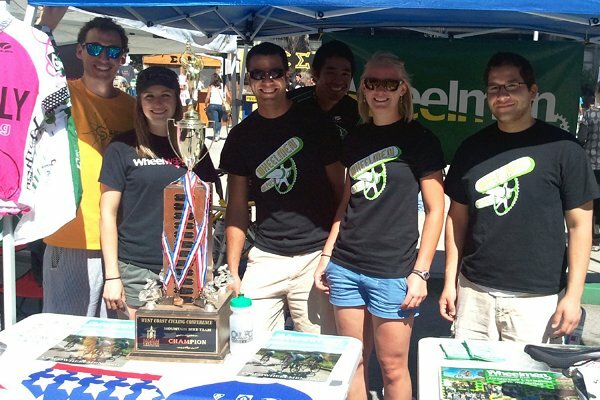 The bicycling club, Cal Poly Wheelmen, set up a booth for the Saturday Open House. Here, Nik and some of the club's riders show off the Mountain Bike Team's Western Collegiate Cycling Conference Championship trophy, which Cal Poly has won 12 times in the last 16 years. 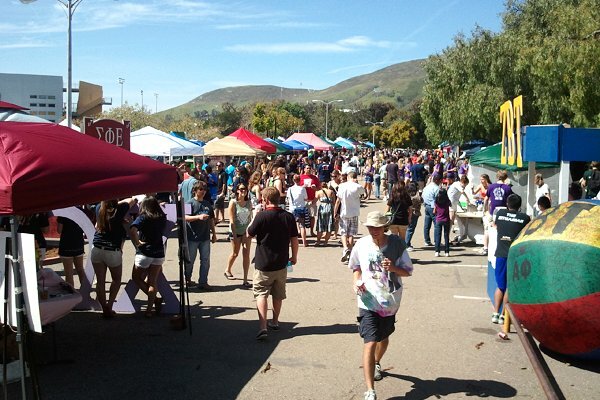 The extracurricular clubs and student organizations set up tents and booths for about three blocks stretching through the middle of the campus. Everything from fraternities, sororities, and religious clubs to sports like the Beach Volleyball Club. 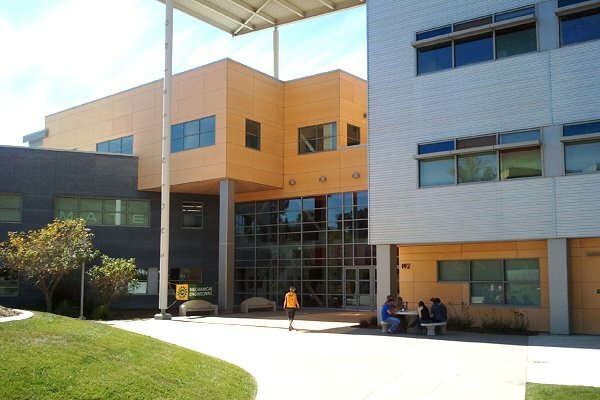 The Mechanical Engineering Building--Nik's field of study. Many of the academic departments had tours and student projects on display. 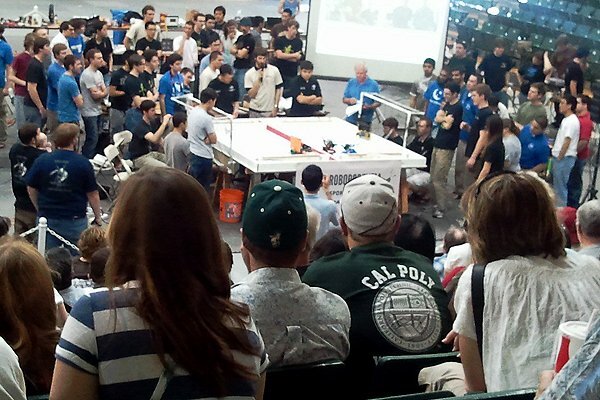 Small, autonomous robots battled each other in the Robodentia tournament. Gorgeous day at Avila Beach. 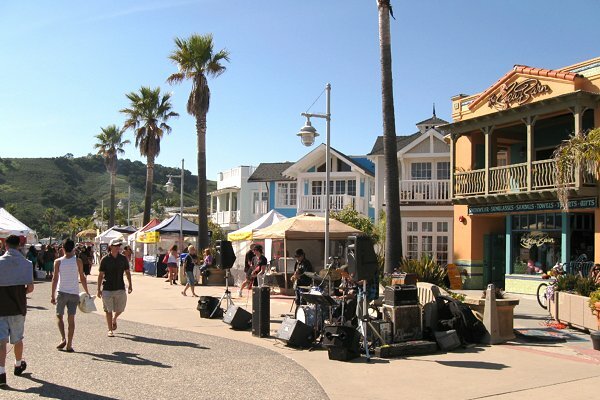 Musicians and vendors are setting up booths for a Farmers Market along the promenade.